A bad hair day for someone with curly, wavy, or somewhere-in-between hair can be a disaster. You can use sprays, mousse, gels and more to try to tame it, but sometimes you just need to bring out the big guns and show your hair who is boss. Many well-kept individuals swear by the flat iron as a daily weapon in the battle against bad hair days. The flat iron sadly was not always in our arsenal, but came into focus just before the turn of the century in 1872 by Parisian man named Marcel Grateau. Marcel used heated metal rods to style and straighten hair into the most popular styles which women deemed as the “Marcel Wave”. 0 years for a major advance to come to the market, but in 1909 Isaac K. Shero invented the first hair straightener to use a flat surface rather than rods. Two flat irons were heated and pressed together to smooth out curls. Just a few years later, the first hair straightener to resemble what we associate with today hit the stage courtesy of Scottish Heiress, Lady Jennifer Bell Schofield. This double plated heated iron was hinged in the center to clamp and unclamp from the hair. 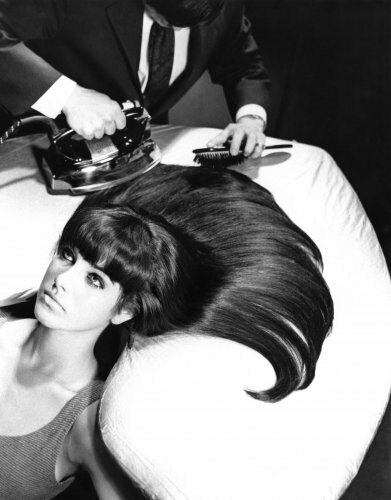 Even after this invention, many women, in a desperate attempt to kill the curls, would lay their little heads down on their mother’s ironing tables and take a scalding and dangerous clothes iron to their hair. Most were helped in this seemingly insane task by their very own family. Thankfully, that method was swiftly carried away after the 1960’s and we moved forward with the Lady Jennifer’s design. From there, well, the rest is history. Much like the hairdryer things became safer as the years passed by. Most straighteners on the market today are made with ceramic or steel plates and plastic handles. As you look into your cabinets today, be thankful for the many people who singed their locks so you could look fabulous!